It’s summer and I finished my differential equations class at Temple so I’m back working at Coles Music Service until school starts again. I choose to patch the crack but I challenged myself to make the repair as good looking as possible within reason. The first thing I did was grab a smashed bell that was lying around from a Custom Z tenor. I figured that the brass would be of appropriate quality and thickness if I cut a piece from one of the bell tone holes. After cutting a rough shape I used a grinding machine with an abrasive sponge type wheel (I don’t know what it’s called, I wasn’t around when the shop ordered it) to further shape the patch. Going back and forth from the tone hole needing repair to the grinder I continued to shape the patch until it sat against the tone hole and the body of the sax flush. Next I soldered the patch to the outside of the tone-hole (never do it inside unless you are actually trying to change the diameter of the tone-hole). When it was sufficiently attached to the horn I then used a Dremel tool with a rubber abrasive wheel to remove excess solder and blend the patch as closely as possible to the tone-hole wall. Once I buffed the tone-hole and patch to a similar surface I filled down the excess of the patch which protruded above the tone-hole and finished off using a rotary file to level the tone-hole and the new patch. I am happy with the way this turned out. The process would have been more difficult on a horn where lacquer loss was a big concern but I think that even in that case it is preferable to do the repair this way and take the loss of original lacquer. In most cases it wouldn’t matter anyway because when a crack like this develops, the chances of much original lacquer being left anyway is unlikely considering age and abuse taken by the horn. Ed Coles Jr. taught me this technique and I believe it is the most sound for this kind of repair on this quality level of horn where it is well worth the effort. This is a H. Couf Superba II baritone sax that I recently repaired for a school. When it came in it was really beat up: Almost all the pads were unusable, bent body, large dents, un-soldered bell brace, just a real mess. Once it was all put back together and everything was set up right and tight it played really well. These have a nice big sound, feel compact in the hands, and have decent key work. My manager Russ, at Coles Music Service in Sewell NJ where I work part time, actually has this same horn for sale currently only his is in much better shape. If you’re looking for a nice vintage horn with a lot of bang for the buck, the Superba II is a good one to check out. Most modern instruments have drawn tone holes. These are the kind you see where the tone hole is formed from the body of the instrument and there is no seam. When the body of the instrument is made it has small holes punched out of the metal. Then a specific diameter metal ball is then drawn up through the hole which widens it and forms the tone hole. Another technique is to cut the appropriate diameter hole and then place a separate metal ring which forms the wall of the tone hole on the body of the instrument. The wall is soldered to the body of the instrument. The advantage of soldered tone holes over drawn tone holes is their superior ability to hold their shape and not warp because of dents or over time as the metal relaxes. 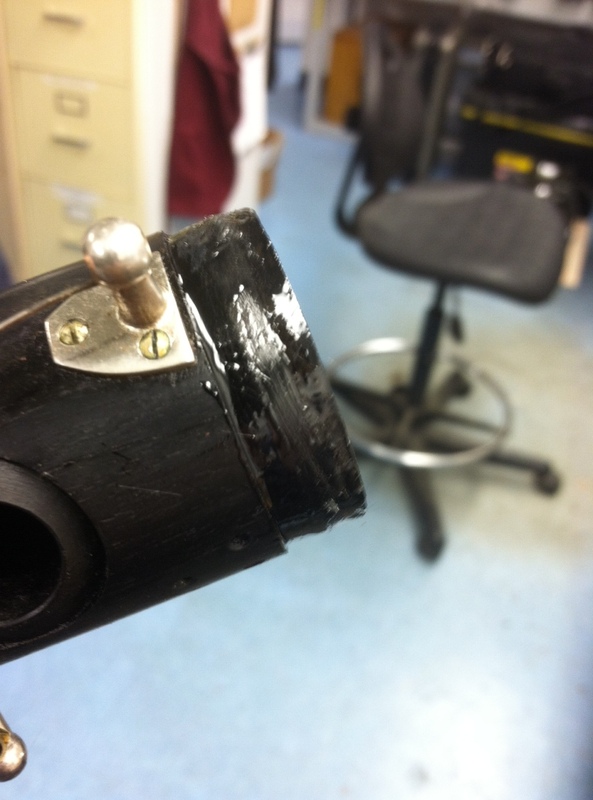 The disadvantage is that on very old instruments, the solder can disintegrate causing leaks. 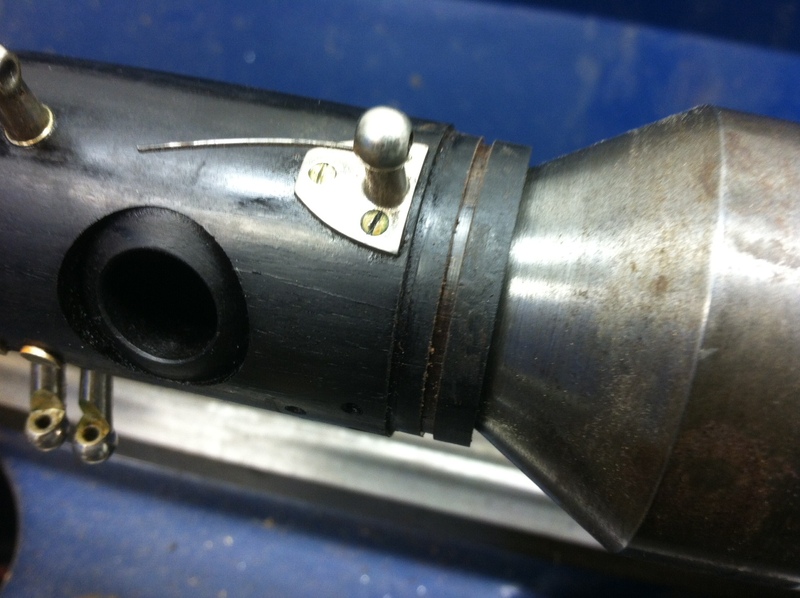 Pictured above is a soldered tone hole on a Conn bass saxophone I was working on. You can see a massive space has formed between the body of the instrument and the wall of the tone hole. To repair this we simply re-solder the tone hole to the body, filling in the gap. Although the procedure is simple, usually where there is one un-soldered tone hole there are others and fixing this requires many keys to be removed. An inexperienced repair person my not notice these problems when they estimate the repair job. That’s why it is important to always estimate carefully and use a leak light. Farewell to my teacher Ed Coles Jr. The man who taught me instrument repair was murdered yesterday by his own son. Edward Coles Jr. was a world class repairman. I feel that the meticulousness and artistry of his work was unparalleled. I’ve seen lots and lots of repair work on all types and levels of horns, and if you’re lucky enough to have had Ed work on your horn, you’ll know that I’m not being hyperbolic. Ed’s passing is an enormous blow to myself, and I’m sure to his friends, surviving family, and to the Delaware Valley musical community at large. Ed’s repair work really embodied his spirit in general. He was always open to new ways of making repairs and learning from anyone that had a good idea. A lot of big time repair people think they’re the end all, they know everything, any way but theirs is wrong. Ed wasn’t like that. I remember lots of occasions where he wanted my opinion on a repair he was making even though he taught me everything I know. When he asked me, he wasn’t just trying to make me feel good (though it did), he genuinely wanted another perspective, to get another set of eyes to see if he’d missed something. Sure, Ed knew he was talented; but he didn’t lord his abilities over anyone. In fact, Ed was also a great educator. Besides mentoring myself, Ed has taught many other repair technicians over the years. Recently he had gotten a gig at the University of the Arts in Philadelphia teaching repair part time to music students. Ed was also an annual feature for music ed. majors at Rowan University in Glassboro where he held clinics for aspiring band teachers as well as ran a free repair both at the Jazz Festival. If Ed had the opportunity, he would have been teaching repair full time. It’s really a shame more people didn’t get to train under him. He was a musician and a band director as well. He directed the Bonsal blues concert and dance bands off and on for decades. I had the pleasure of playing in both bands and let me tell you, Ed really knew his stuff as a director and as a musician. He dedicated a ton of time to these bands, he truly loved being involved in music. Ed was funny and he was generous. He always let me work on my own instruments in the shop after hours, never charged me for any parts, even did free repairs for my fiance before I had learned how to do them myself. And it wasn’t just me, he did so many favors for so many people and he never asked for anything. Lot’s of people asked for favors, believe me, lot’s of people who had no right to be asking for favors, but Ed did them anyway. Ed never burned bridges, even with people who treated him like crap. And Ed loved his family more than anyone I think I’ve met. By all accounts he should have hated some of them for things they did to him…but he didn’t. It’s strange that I know so much about his family life, normally I don’t think bosses tell their employees as much personal stuff as he told me, but because I was privy to a lot of the comings and goings in his life when I worked with him and I knew his family pretty well, I think I really got a good sense of who he was. The circumstances of Ed’s death are tragic for so many reasons, maybe the most tragic is that the man who killed him, his son, doesn’t understand or appreciate that his father loved him dearly. If he did he would never have done the evil that’s he’s done. Edward Coles Jr. was a great man. I doubt I will ever meet anyone like him again. Ed was the most generous man I’ve ever know and one of the kindest. I will not forget him. 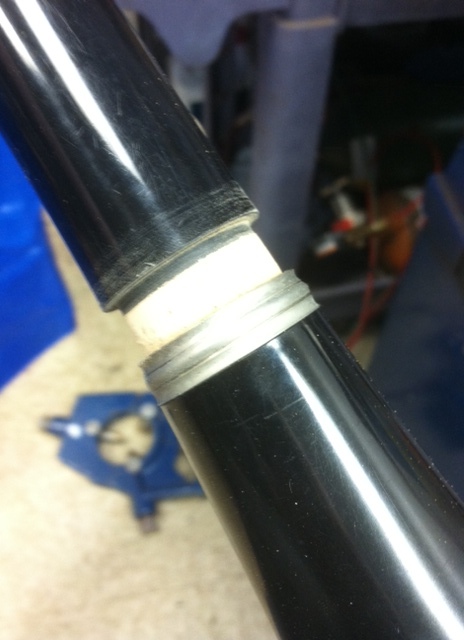 A relatively new way to fix cracks in woodwind bodies is carbon fiber banding. The first step is to cut a channel for the fiber to lay in. I did this on the lathe. Then we lay some epoxy in the cut and wrap the carbon fibers around, making sure we get them covered in lots of epoxy. I cut off the excess fiber and let the joint sit overnight. Once it is nice and hard, I sand the excess glue and fiber down until it is even with the body. A little bit of light sanding with micro-mesh afterwards and the band is hardly noticeable. Unfortunately, I don’t have a picture of the finished product as a metal ring went over the banding so you wouldn’t be able to see it anyway. 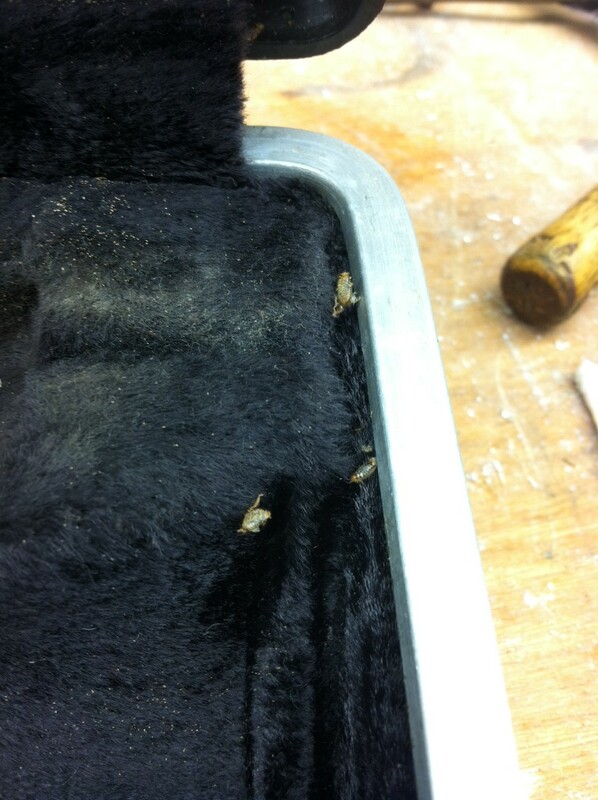 They’re a little bug that likes dark places and to eat the glue used in woodwind pads, especially flute and clarinet. If you want to avoid this problem, don’t leave your instruments in a dark place for a very long time and air the case out every now and again. 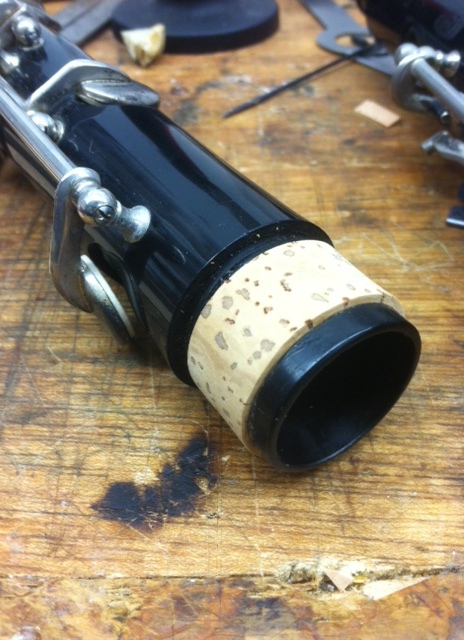 Do you remember what your tenon corks looked like when your clarinet or other woodwind was brand new? Next time you have a tenon cork replaced, take a close look at the job. Does it look brand new again? First I apply the cork, taking care to cut it carefully to fit between the rails. 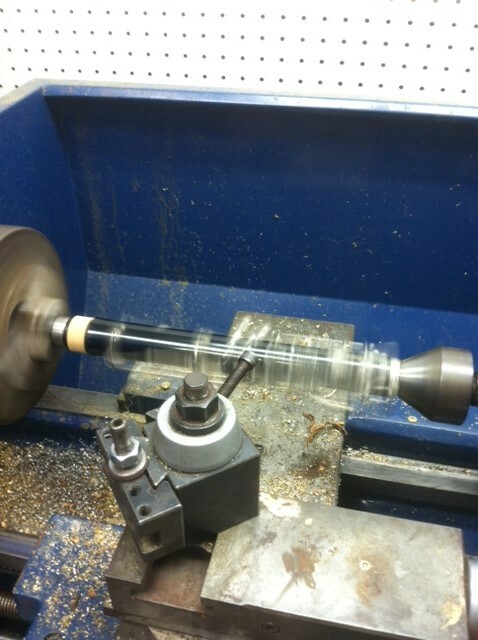 Next I put the clarinet body into the lathe. 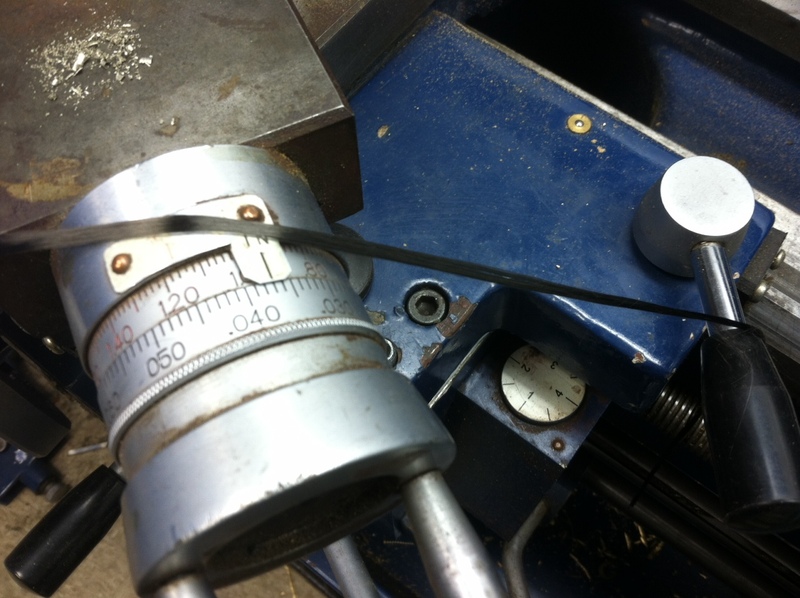 It’s held in place by a live center which spins and one end and a bench peg in the chuck. 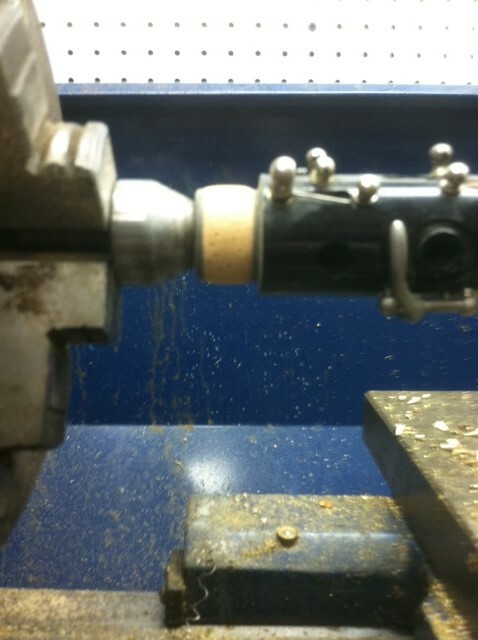 As the lathe spins the body, I use a strip of sandpaper to cut the cork down and shape it. I check the fit with the socket of the instrument every so often and gradually get the fit I want. I don’t want to sand too far. The fit should be so about 1/4 to 1/2 of the tenon can fit into the socket dry without any cork grease. I shape the cork into a barrel shape, tapered on each end. 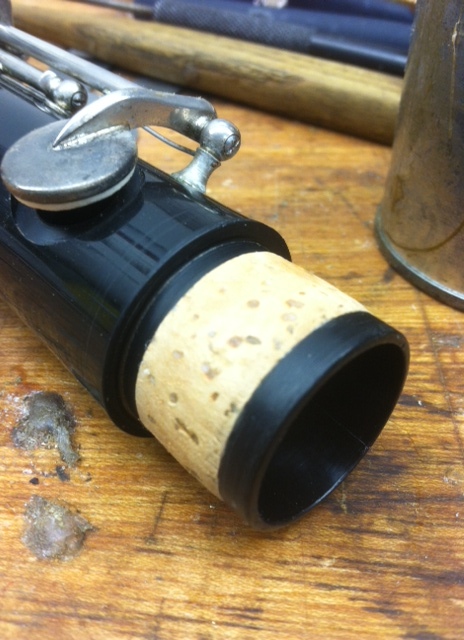 Finally, I impregnate the cork with wax to lengthen its useful life and then apply cork grease to check the final fit. I wipe the excess off with a paper towel and q-tips. Using this method you get a tenon cork that lasts and looks like it did when it left the factory.